CivWorld shutters its doors after two years on Facebook. "Rulers of great civilizations, repent! The world is coming to an end!" While one Civilization II game has slogged on for a decade now, the social spinoff CivWorld announced that it will be going under after two years. Current players have until May 29th to customize their throne rooms, spend their CivBucks, and say goodbye to their personal empires until the Facebook game goes dark forever. Famed series creator Sid Meier was involved with CivWorld's design. While it still had the strategic core the franchise is known for, it also mixed in other elements common to the social medium. The result was a game that focused more on cooperation with other players rather than competition between them. Unlike traditional Civ games, CivWorld had no actual end, with the intention to keep players clicking indefinitely. CivWorld hit its peak in July 2011 with 88,754 active daily users. In January of last year, that number was 5,000. Today, it barely scrapes by with 2,000 daily active users. Even happy cartoon Sid wasn't enough to keep players clicking. Facebook has not proved to be a very receptive place for social versions of AAA titles. CivWorld joins other failed social adaptations like Dragon Age: Legends and Ghost Recon Commander. 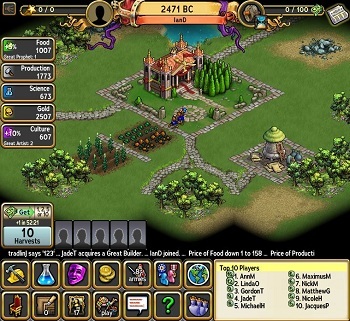 Ironically, Civilization 2 designer Brian Reynolds joined (and recently left) Zynga. Along with the former giant's recent cullings, it's not difficult to speculate that the social bubble is deflating a bit, if not yet fully collapsing. It should be interesting to read postmortems about these experiments with social gaming in years to come. Starting April 2nd, players will no longer be able to redeem their Facebook credits for CivBucks. This gives players two months to spend their balance until the sun sets in CivWorld forever. Interested parties can read more details about the eminent apocalypse here.